ELWE -L'Italie Dressee sur les Observations de Mrs. de l'Academie Royale des Sciences..
ELWE, J.B. - L'Italie Dressee sur les Observations de Mrs. de l'Academie Royale des Sciences..
L'Italie Dressee sur les Observations de Mrs. de l'Academie Royale des Sciences.. - ELWE, J.B. 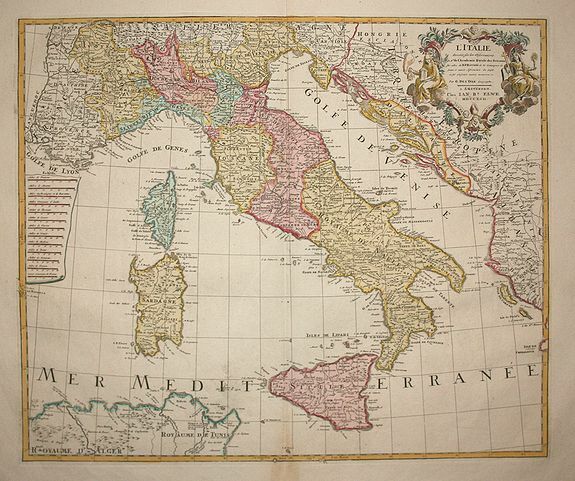 Description :A decorative large map of all of Italy, including Sicily, Sardinia and Corsica, the surrounding parts of France and the Balkans. It is based on the geography of Guillaume Delisle and the observations of the astronomer Riccioli. The map is filled with detail and decorated with a title cartouche. Condition : A bit browned in the centerfold underborder.